Do you want to have a relaxing and calming moment in the hot summer? 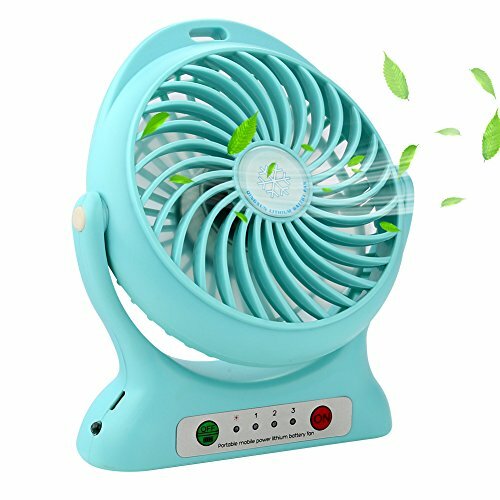 The Mini Fan is ideal for indoor and outdoor using, such as beside your bed, computer, table, desk, sofa, car, picnic, hiking, mountaineering, fishing, Camping and etc. Three speed level to control and LED light on side for emergency lighting use. It's also a 2200mAh power bank, compatible with Digital Cameras, Tablets, MP3 and MP4 player, iPhone, iPad, Smartphones, Android, Apple, Samsung. The sturdy Misting Spray Fan produces a soft breeze to keep you cool and relaxed . 5. High efficiency and low loss. energy saving and environmental protection. 6. Note: Fan can't be worked without lithium battery in. 360 DEGREE ROTATION: The mini fan will swivel up or down-- able to do a 360 degrees ,allowing you flexibility and providing widespread coverage ensuring a 360 degree cooling experience! 2000mAh POWER BANK: Compatible with Digital Cameras, Tablets, MP3 and MP4 player, iPhone, iPad, Smart phones, Android, Apple, Samsung. CONVENIENT PERSONAL BATTERY POWERED FAN: Operated by built-in 2000mAh rechargeable battery or a micro USB cable, three speed level to choose, Upon your choice, the fan works from 2-6 hours after fully charged, and come with a bright white LED light on one side for illumination use. If you have any questions about this product by accmor, contact us by completing and submitting the form below. If you are looking for a specif part number, please include it with your message.